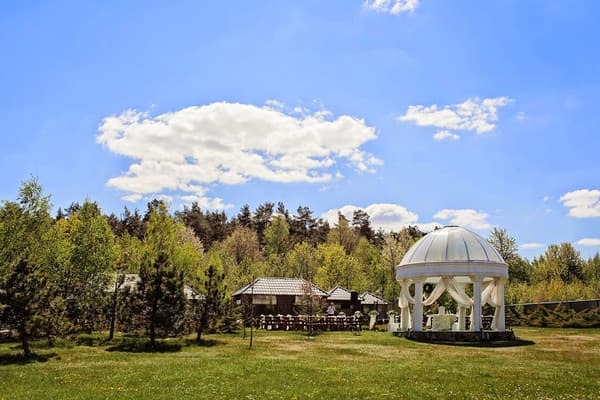 Recreational complex "Restpark" is located 9 km from the center of Lutsk near to the motorway M08. The complex covers an area of ​​more than two hectares of land. 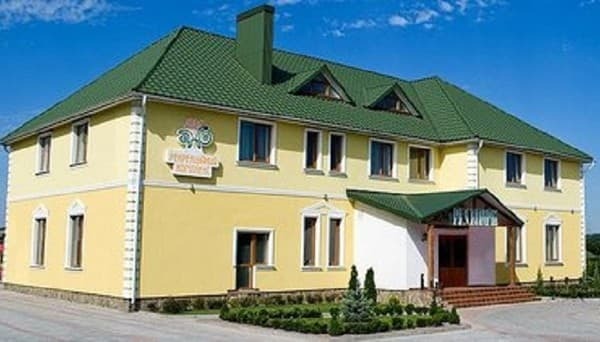 The uniqueness of the hotel is beautiful Volyn nature with its forests and lakes. 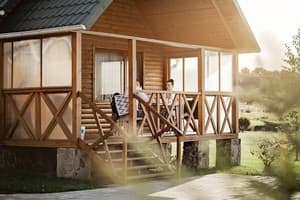 The hotel has 15 cozy and comfortable rooms of "Standard" category, "Junior", "Lux" and wooden cottages. The rooms are designed in a variety of color schemes, and their design allows you to choose the most suitable room in which every guest will feel at home. For hotel guests "Restpark" offers services such as Wi-Fi, parking, billiards, conference room, library, table tennis, children's playground. Guests can go fishing in the lake, relax in the shade of the trees, walk along the tiled decorative stone paths and enjoy the silence. Near the complex is a pine forest where you can go walking or led walk. 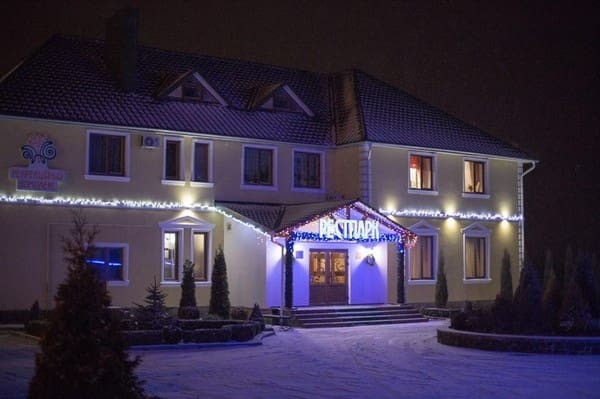 A delicious meal, guests have the opportunity in the elegant restaurant of the hotel, which combines a high level of quality of service, excellent cuisine and reasonable prices. 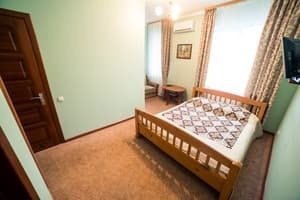 Description of the room: The room is 14 square meters in size and is equipped with a wooden single bed with comfortable mattress, soft folding sofa. If necessary, additional accommodation of 1 person is possible. 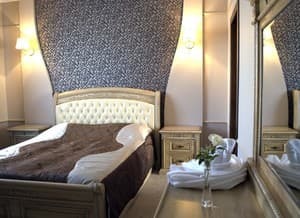 Description of the room: A cozy one-room with two twin beds or a large double bed combines maximum comfort and all the necessary conditions to relax from the road and relieve fatigue after a busy day. Room size is from 12 to 14 sq.m. 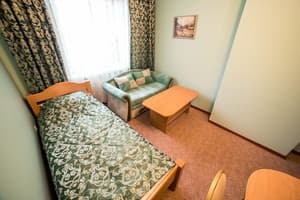 Description of the room: This room is located on the second floor of a separate guest house on the territory of the recreational complex. The room area is 23 sq.m. The room is equipped with a double bed and a soft folding chair. Additional accommodation for one person is possible. Description of the room: Rooms of this category are located in a separate building with their own parking. Modern design, warm calm colors create a special atmosphere of comfort and comfort, which is perfectly complemented by real fireplaces on wood. The rooms are equipped with double beds. The total area of ​​this category is 30-37 sq.m. Additional accommodation for two people is possible. Description of the room: In the special zone of the complex there are four wooden cottages. Each of the cottages has a large double bed, as well as a fold out couch for two more guests. For the comfort of the houses are equipped with completely autonomous water supply and heating systems. A great place for coffee or a romantic dinner can be a spacious veranda with original wooden furniture. Все понравилось.Прекрасное место,чтобы провести время с маленькими детьми или же провести свадьбу или день рождения: есть и батут, и детская площадка, озеро с черепахой и рыбками большими и маленькими, лебеди плавают.Большая ухоженная территория. Дуже маленький номер,весь час чіплялися за телевізор,щоб пройти від ліжка.Таке собі ліжко- кімната.Якщо вікна виходять на трасу то чутно рух машин.Якщо приїхати у суботу,неділю то можна стати свідками весілля та всього ,що з тим пов"язано. Нам очень сильно понравилось. Идеальное соотношение цены и качества. Персонал супер - очень душевный люди, спасибо Вам. 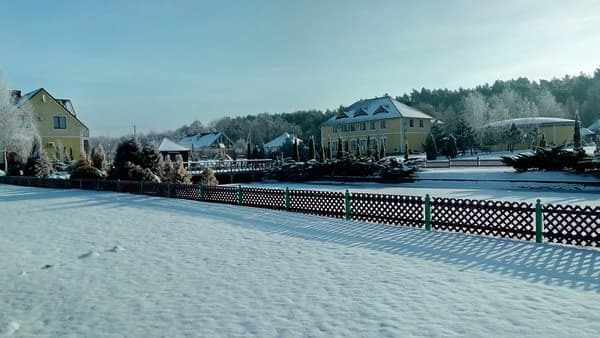 Для переночевать одну ночь- нам большего не нужно. Приветливая и приятная девушка на рецепции, чистота, да все в принципе. Немного маловат номер, но в целом все отлично! Объективности ради скажу, что стейк из телятины был не достаточно сочным. Остальная еда, как и скорость обслуживания безупречны. Новый отель, чисто, есть Wi-Fi, завтрак. Все было отлично! Чисто, уютно, комфортабельно! Отдельное спасибо поварам! Очень вкусно! Отличная гостинница! Всё красиво, ухоженная большущая территория, приветливый персонал и великолепный завтрак, включенный в стоимость номера. Спасибо! Children under 12 years are free of charge without extra bed and breakfast. From w / d - trolleybus №3, №7 (stop "Zavokzalnaya market"), by bus №2, №16 (stop "Zavokzalnaya market") with transfer to a trolley bus number 3 or bus number 3 (stop "Hotel Luchesk" ). From the bus station - trolleybus №3 (7 min walk to the bus stop "Church of All Saints of Volyn land") - trolleybus №7 (walk 5 min to the stop "Railway Station"), by bus №2, №9, №9a, №15, №16, №17 with a transfer to a trolley bus or taxi №3 №3.